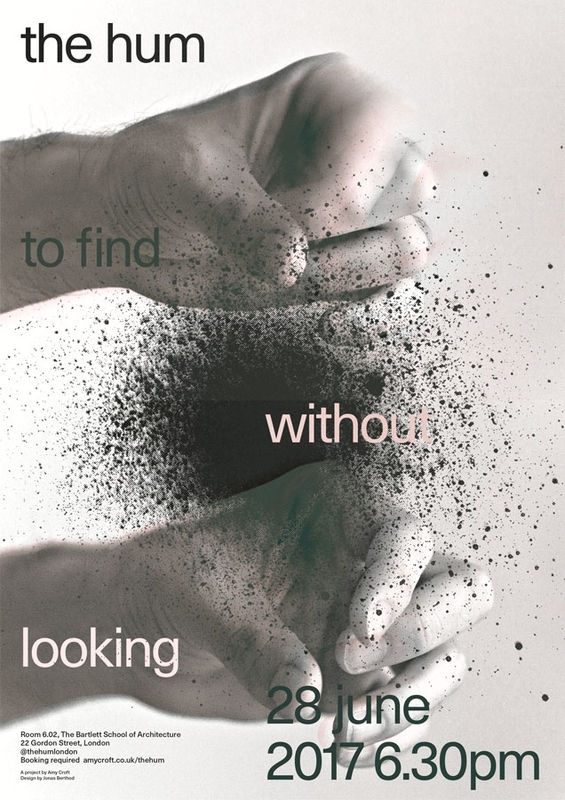 This second event in THE HUM series titled To Find Without Looking explores the activity of wandering: both as a mode of being in a city, and as an experience of internally focused thought. What if the fidgets, tics and blinks our bodies exhibit during daydream or mind wandering are not just by-products of our inattention to the external world but an embodiment of where our wandering minds are travelling? This alternative interpretation is suggested in an experiment write up by Paul Seli, and set in motion a sequence of emails, meetings and conversation that brought together this next ‘Hum’ constellation of Felicity Callard, Manu Bazzano and Michael J. Harding. Our attention floats across specific yet ephemeral points: perhaps it is between the breath, the weight of ones own body, the pattern, smell and din of people moving at a rush hour interchange, and inner ruminations on the possibilities of a future faux pas. How may we map and draw lines between such wavering flickers of stimulus? What can we learn from reading between the traces of subjectivity, left by histories of daydream research? And how may these aimless, unproductive and meandering activities of mind and body be considered subversive acts? In an approach which draws on politics, histories, psychologies and physicality’s of wandering, The Hum will look to unearth a vocabulary that describes what the embodied, phenomenology of a wandering mind and body might be. The Hum: To Find Without Looking will take place in two halves. The first will be an intimate workshop of reflective yet physical exercises led by Michael J. Harding. This will be for a small group so please email thehum@amycroft.co.uk for further details. The second half is an open discussion held at UCL Bartlett, with contributions by Felicity Callard, Manu Bazzano and Michael J. Harding. Michael J. Harding will guide us through a set of timed exercises and happenings that will blur theatrical plot with therapeutic sense exercises, intended to balance one’s sympathetic and parasympathetic nervous system. Attention, focus, realness, daydreaming, fabrication, madness, dishonesty, aporia, absurdity, unintended consequences, farce, Oedipus, Macbeth, psychosis, visions and spirituality are among the touching points for this contribution. The first half of his work (taking place as a small group workshop) will involve some participation, please email for more details and to book: thehum@amycroft.co.uk. “I’m wanted at the traffic jam: they are saving me a seat” Manu Bazzano will present ‘In Praise of Reverie and Forgetfulness’ a meditation which begins with this Leonard Cohen lyric. Psychology denigrates forgetfulness; mindfulness chastises rumination; therapy disregards the unconscious. In a neopositivist, neoliberal world were body/mind meanderings are seen as futile, where crossing borders is illegal and vagrancy is considered fruitless, wandering is subversive: the refusal to occupy our reserved seat in the traffic jam. Felicity Callard will present her ongoing research into the history of mind-wandering and day-dreaming. She is attempting to put together a daydream archive – through finding traces of these ephemeral phenomena in records left by psychiatry, psychoanalysis, industrial psychology and educational psychology over the course of the last century. What do these traces tell us about how experiences and theories of day-dreaming and mind-wandering have changed over time – and how they have been variously seen as problematic, estimable, indicative of mental pathology, subversive, and potentially revolutionary? Manu Bazzano is a psychotherapist and supervisor in private practice, primary tutor at Metanoia Institute, London, and visiting lecturer at the University of Roehampton London and various other colleges in the UK. He is the author of the forthcoming Nietzsche and Psychotherapy (Karnac), and editor of the forthcoming Re-Visioning Person-Centred Therapy: the Theory and Practice of a Radical Paradigm (Routledge). He lectures and facilitates workshops internationally on Zen and post-phenomenology. He studied Eastern contemplative practices since 1980 and in 2004 was ordained a Zen monk in the Soto and Rinzai traditions. www.manubazzano.com. Michael J. Harding writes musical theatre. His latest work, Removal Men, dealt with immigration removal officers undergoing nonviolent therapy. Recent collaborators include Belarus Free Theatre, ArtsAdmin and Haringey Shed. He is currently working on a show about George Fox, the founder of the Quakers.